Programmers typically rely heavily on the clipboard – frequently, a single clipboard isn’t enough. Some desktop systems, like KDE, provide tools to support multiple clipboards, allowing the user to switch between different content previously stored in the clipboard as required. Clippets provides a similar feature integrated into the Eclipse IDE. Among other things, this means that switching clipboards works in the same way on all platforms supported by Eclipse, which can be useful for developers frequently working on different systems. 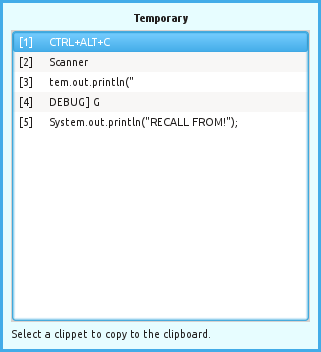 One clipboard content item stored by the plug-in is called a “clippet”. Clippets can be labelled and arranged in multiple lists called “clippet collections”. Individual collections can be marked as persistent, which causes them to be stored permanently so that they are still available when Eclipse is restarted. Review Clippets at the Eclipse Marketplace. Become a follower at Facebook or Google+. Version 2.0 of Clippets was released on 2015-04-06. You can read the user guide here. Clippets is licensed under the terms of the Eclipse Public License v1.0.